Hey lovely readers! 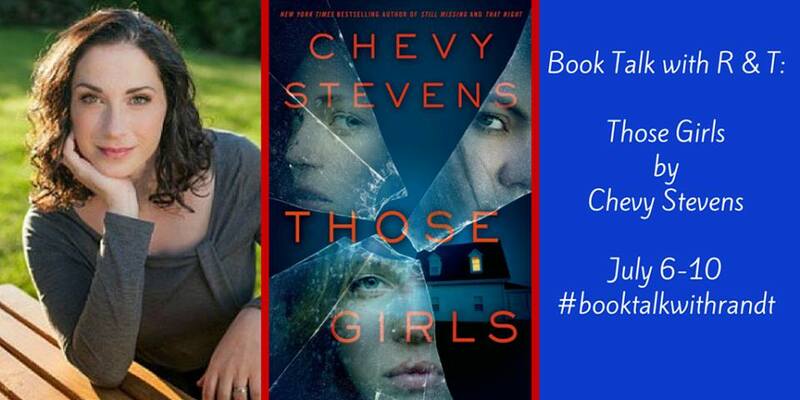 Today as part of the Book Talk with R & T feature, Chevy Stevens took some time out of her busy schedule to answer some questions for Rhiannon and I. Hey Chevy! We (Rhiannon and I!) are so excited to be featuring THOSE GIRLS for Book Talk with R & T! Chevy, THOSE GIRLS is being talked about as a story of survival and revenge. How did you decide to write about these particular events surrounding the Campbell sisters? I liked the idea of sisters on the run. I wanted them to have committed a crime that put them on the wrong side of the law so that when they got into a nightmarish situation, they wouldn’t be able to go to the police for help and would have to figure out a way to survive on their own. I wanted to write about loyalty, and how these sisters would do anything for each other. Stories like The Outsiders really struck a nerve with me and I wanted to create that same sort of feeling. How much input did you have in the cover selection? I’m fortunate that my publishers have an amazing art department and my editor does include me in on the final decision. She sends me samples of the cover and we discuss if it needs changes, but this one we all loved right away! Hey Chevy-lots of writers have quirky habits. Care to share any of yours? I love wearing ear plugs when I write. I also need to have tea, coffee, or water on hand, and when I’m stressed about a certain scene or chapter, I snack a lot! I have learned to have healthy options nearby or I will eat an entire bag of chips. Can you name an author (or 2) that you would absolutely be thrilled to write a blurb for their next book? Wow, that’s hard. There are so many I love! I think Megan Abbott is brilliant and of course, Gillian Flynn. Let’s talk writing space-do you have one? Or does the writing happen whenever you have time? I do have an office in my house, which is where I’m working today, but I spend most of my writing time in our travel trailer. I have a two and a half year old daughter who is home during the day, so it would be impossible for me to work in the house. She often manages to run away from the house, though, and comes to visit me in the trailer. Our two dogs also like to hang out with me while I write. Can you share any info about your next book? My sixth book is called Not Alone and it’s about a woman, Lindsey Nash, who believes her abusive ex-husband is stalking her. Don’t forget to check out the #giveaway of THOSE GIRLS (US only) and Rhiannon @ Ivory Owl Reviews! Nice interview – the book sounds interesting. I’ll look out for it. Being British, I thought Chevy was a guy – CLEARLY she’s not! Thanks for sharing a great interview, ladies! I loved learning the story inspiration, and now I’m even more eager to read it! Yep- she was talking on her Facebook fan author page about not changing her last name when she got married and she mentioned that she already had a pen name!